Howard Miller clock repair requires the skills obtained by a master craftsman to preserve the monetary value of your timepiece while maintaining the aesthetic qualities that this famous manufacturer built its name upon. For proud owners residing in the Rexburg, Idaho area, Grover Service Centre is the best choice for performing the delicate services these beautiful chronograms deserve. As one of the world’s largest manufacturers of mantel and grandfather clocks, Howard Miller has built a reputation for crafting quality timepieces out of the finest materials available. This renowned company provides an Heirloom Record Certificate to preserve its ownership and maintenance records for posterity, which adds to the intrinsic value of your timepiece. Keeping this valuable chronogram running accurately calls for superior maintenance and restoration services that are rendered by a certified professional. Martell Grover, the owner and founder of Grover Service Centre, is highly skilled in the art and science of horology. Your Howard Miller clock repair job will entail a full inspection, cleaning of all internal mechanisms and restoration of non-working parts. Each piece of the movement will be reassembled by our Swiss-trained master watchmaker to ensure accuracy and improved functionality. 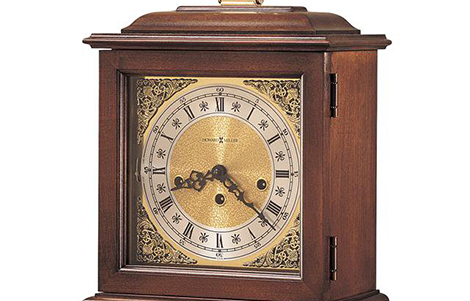 Howard Miller has established a longstanding reputation for providing quality floor and mantle clocks that maintain exceptional value and superior quality. Grover Service Centre is pleased to offer restorative services for these heirloom timepieces.